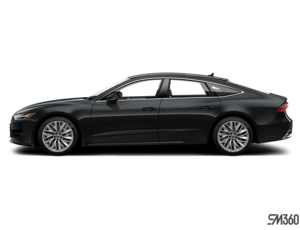 When the Audi A7 first arrived on the market, it was a standout in terms of performance, comfort, luxury, but mainly because of its unique coupe-like design. 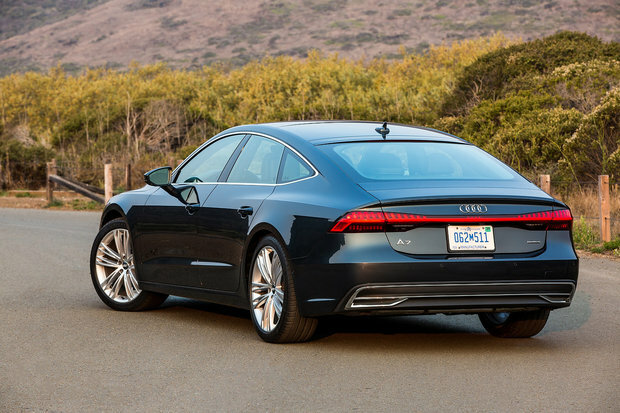 Now in its second generation, the Audi A7 is more beautiful than ever, and more advanced in every way. The key to the Audi A7’s sustained success over the years has been its blend of design and functionality. Consumers want a car that stands out on the road and gets noticed, but not at the expense of practicality. The Audi A7 features a cargo area that’s easily accessible thanks to its hatchback lid, but it doesn’t look like it. You therefore get the functionality and versatility you want from your luxury premium four-door vehicle, and interior space you won’t find elsewhere in a car in this price range, but without ever sacrificing the car’s smooth lines and sporty styling. Built on the same platform as the Audi A8 and sharing its interior design with Audi’s top-of-the-line sedan, the A7 has roughly the same footprint as the outgoing model. There’s plenty of room upfront and even the rear seats are accommodating with a lot more interior space and head room than you imagine when first looking at the car. A 3.0-liter turbocharged V6 engine is the only engine option at the moment, but we can expect upcoming S7 and RS7 models to be introduced. That said, the turbo V6 provides more than enough power with its 335 ponies and 369 pound-feet of torque. That will get you to 100 km/h in less than 5.0 seconds. There’s so much tech in the 2019 Audi A7, it’s impossible to list everything. We will tell you, however, that it has every single driver assistance technology known to man, it can brake automatically to prevent accidents with any dangerous vehicle at basically any speed, and it can take over steering duties to keep you pointed in the right direction. 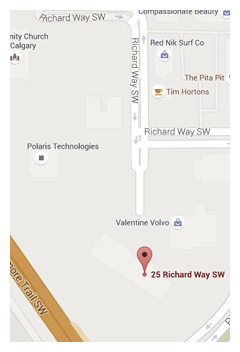 It’s self-driving abilities are second to none and even surpass what Canada currently allows for vehicles on the road. In other words, it could probably drive you to work on its own, but legislation doesn’t permit that quite yet. 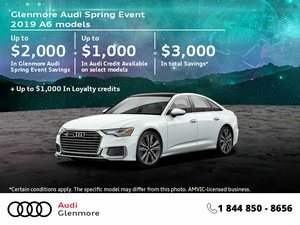 Come check out the 2019 Audi A7 today at Glenmore Audi!